Each year national and international experts in medical, radiation and surgical oncology come together at the ANZGOG Annual Scientific Meeting. Our Annual Scientific Meeting focuses on developments in clinical trial research in gynaecological cancers. 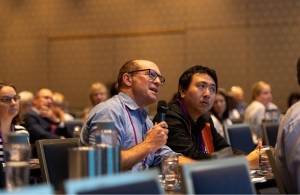 The meeting is an opportunity for ANZGOG members and international guests to exchange information on current global trends in gynaecological cancer treatments, latest research practices and future research objectives. It is also an opportunity to share knowledge and ideas with national and international authorities in the field of gynaecological cancer research. Members are encouraged to attend as many sessions as possible, to network and share knowledge and foster new collaborations. 2020 marks ANZGOG’s 20th anniversary and the ASM in Melbourne promises to be a fantastic occasion! To find out more about the 2020 Annual Scientific Meeting, email our Membership Officer, Heshani Nesfield, at hnesfield@anzgog.org.au.